Yesterday was the first day of Mike’s mandatory overtime period at his (not so) new (anymore) job, so we’re making a few adjustments to our routine. Since there were a few things I needed for the meal I had planned for Monday, and since I wanted to get started before Mike got home, I took a trip down to Union Square on my lunch hour to peruse the Greenmarket – my first weekday visit in a long time. As great as it is to have Mike working so close that he can easily do our marketing during the week, I realized yesterday how much I have missed going there myself. 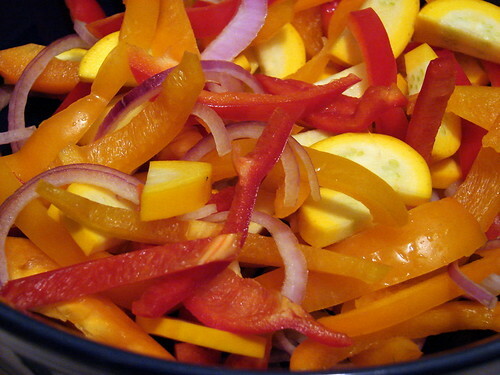 I came home with some lovely red and orange bell peppers, a yellow zucchini and red onion, which I sautéed with salt and olive oil until caramelized. I grated a chunk of Cato Corner’s Womanchego cheese, and layered that on small flour tortillas with black beans, the caramelized veggies, more cheese and another tortilla. I cooked these quesadillas in a dry nonstick skillet until the bottom tortillas were crisp and toasted, flipping them carefully to cook the second side, and I served them with a dollop of sour cream and a scoop of freshly made pico de gallo (you knew there had to be tomatoes in there somewhere… ). This was nothing fancy, just a super quick, easy and light weeknight dinner. Makeshift quesadillas! Looks delicious….now I want a quesadilla. 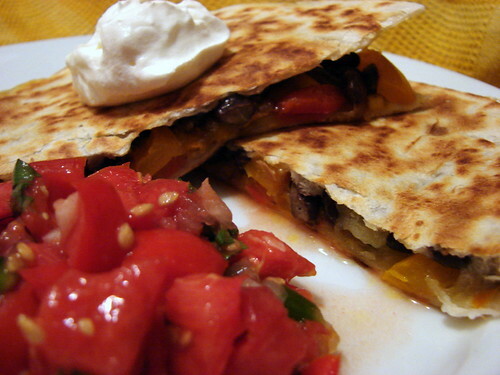 What a simple and very delicious dish – the tortillas look so crunchy! Jennifer, the word mouthwatering gets tossed around a lot on food blogs. But that was precisely my response to the first photo in this post.